I would say 80% of all computer problems are caused by either viruses, or anti-virus software. Today I could not print. Jobs would go to the print queue and fail. I could access the printer, my drivers were the latest and previously worked, and the printer would work for others, it just wouldn’t work for me. After some thought there was only one conclusion: McAfee. Sure enough, in all of its wisdom it had seen fit to firewall explorer and a few other normal Windows processes. I cannot overstate my contempt for McAfee, Norton, and pretty much all other anti-virus software. They can take a brand new machine and immediately age it a few years by cutting its speed dramatically. If you are foolish enough to install one of them on an older machine there is a good chance it will be rendered unusable (not from impatience either, we are talking 5 minute boot times and another 5 minutes to get to the Google homepage). They guarantee nearly all of the detrimental effects of having a virus, and people voluntarily put them on their computers, even paying exorbitant amounts of money for them. I would say without hesitation that this medicine is, if not worse, at least as bad as the disease. That isn’t to say anti-virus programs don’t have their place, but it is a sad lonely place that shouldn’t be anywhere near your day to day computing. It’s official, I don’t like Detroit anymore. My window was broken. Again. I take back everything I said in my last post about not getting angry, I am angry, very angry, one might even say quite peeved. I am looking for someone to blame and unfortunately the people who broke my window are not around to throw rocks at (this one was caught on tape but the quality is so low there is no way to ID him). Instead I will throw rocks at our beloved mayor. He seems like a fair enough target, he is in charge, he has wasted millions of dollars of the city’s money which could have been used to pay some of the 1000 cops he laid off, and he is almost undeniably corrupt. Well it is undeniable if you are on this side of the rabbit hole. In fantasy land, where Kwame apparently lives, a “lynch mob” is out to get him. I’m not sure who is supposed to be in this mob, perhaps the single white member of a city council that has repeatedly called for his resignation, or maybe just maybe he is pulling the race card yet again to get a knee jerk reaction of solidarity. There are plenty of reasons to dislike him as mayor, and none of them are racial. The Detroit Free Press has a number of really good articles detailing his many indiscretions, they have a whole “Mayor in Crisis” section. Or just head to Wikipedia for a good summary (about 10 pages worth of controversy). I filled out my taxes today, I ended up owing a little, but then I found out I was eligible for the $600 stimulus tax rebate. $600 is good news, who wouldn’t want $600? However, this good feeling is tarnished somewhat when I think about the mind numbing deficit that our Republican government is once again pushing us through. I seem to remember something about fiscal responsibility being associated with Republicans, but this is apparently no longer the case. Unfortunately the country appears to be run by short sighted idiots who only care what happens for the four years they are around. They in turn are surrounded by savvy bankers who are more then willing to up the limit on their credit card. I honestly think that the country is being run by the Bluths. 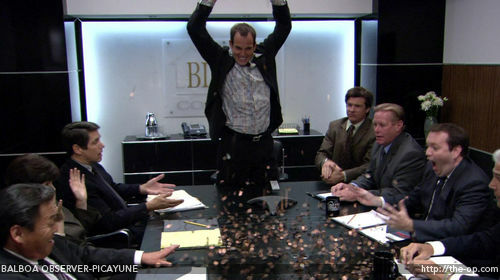 When you think about it Gob’s management style actually bears a striking resemblance to the policies of George Dubya. To protest this lack or foresight and out of pure spite I will be spending my $600 economic stimulus package in another country, the Czech Republic to be exact. At this point I figure the only party that takes fiscal responsibility seriously is the Libertarians. As there is virtually no chance of them being elected I have decided to be petty. I am taking my stimulus package and I am leaving the country. Well it has started snowing again. Snow is pretty in January, by the end of March it is wet, annoying, and just depressing. I am so looking forward to spring, but I am beginning to wonder if it will ever come. If this keeps up I might have to put my fancy pillows to good use again keeping the apartment warm. That was actually during winter proper, when it was zero degrees outside and I hadn’t figured out yet that you have to open the cover on the radiator to let the heat out (who knew?!). I also have a new reason to worry about my car. Recently one of the girls I work with, Jing, had the catalytic converter cut off and stolen from her Honda Element. Price to replace $2000. It was stolen in the middle of the day, in broad day light, while her car was parked in front of where we work on a somewhat busy street. About two weeks later they tried to steal Alex’s. Apparently they got scared off because the exhaust pipe was only cut through on one side. I am already paranoid about my windows, now I get to be paranoid about my exhaust too. Yippee. On a whim I looked up how much we have spent on the war in Iraq as of right now. It is about $440 Billion with a B. Estimates of the total cost by the time we get out are in the neighborhood on $1 Trillion, but lets just focus on the 440 right now. $440 billion that is about $1500 for every man, woman, and illegal immigrant in the United States. Thats a good amount, I think most families of four could use an extra $6000, but if we are going to spend it what could we get for it? Well we could have given it to the Iraqis directly, it would have been about $15,000 for every man, woman, and child in Iraq. If you thought your family of four could use $6000 think what a family of four in Iraq could have done with $60,000. Considering that the average salary there is about $1000 a year (as far as I can tell) I am thinking that would have gone a long way. We always could have spent the money at home, fixed that pesky social security problem, repeated the Apollo project four times (we could have gone to Mars, Venus, Mercury, and Jupiter!) or maybe just not DOUBLED our national debt (seriously when he took office $5.6 Trillion, now over $9 Trillion, its not double yet, but I’m sure it will be before he leaves). After all of this Bush is complaining about the proposed budget from congress because it was over budget by $10 billion. Is he f***ing insane? Lets see where could be get an extra $10 billion…where indeed. Your Father Smells of Elderberries! PowerPoint, not too much to discus, you make up slides containing text, pictures, and movies and you go from one slide to the next. As programs go very simple, not a whole lot to screw up, so one might think. Microsoft PowerPoint has been in development for 20 years, it is part of software couple (Windows and Office) that has built one of the largest companies in the word and helped amass the largest personal fortune in the world. After 20 years (20!) of work and virtually unlimited money and resources why oh WHY won’t my movies play! After watching a fair number of professional presentations I would give the average presenter who is working from someone else’s computer about a 50% chance of getting their movie to play. I really don’t see what is so hard about it, the pictures are included in the PowerPoint file why are the movies left out in the cold where they inevitably get lost? I mean come on, at least give me the option to roll it up into one file. This isn’t 1999 any more where I need to fit my presentation on a 1.4″ floppy. They have these handy things called “flash drives” and “networks” which allow “transfer” of very large files. Now cooler heads might come along and say “but wait they do have an option to include everything in one file”. Yes they do, a wimpy pathetic thing that could not find my movie even though nothing had moved since I added it one minute earlier, which generates an installer that will install (install it? I just want to play it) your presentation on some other computer. ??? (long string of expletives) ??? Does this makes sense to anyone? Anyone? Who says a monopoly inhibits development? Whoever they are, I bet they hate freedom too. You are currently browsing the archives for the Righteous Fury category.